One room where everybody wants to do everything. Pattern 139. FARMHOUSE KITCHEN. Merry Christmas. We had 6 house guests joining our 5 for comfortable family mayhem, eleven folks did most everything in our big room, consuming vast quantities in the process. Cristin directed the deep dish apple pie making from our kitchen peninsula. It was a group activity performed "in the round" with witty remarks flying everwhere. We had sweet apples and tart apples a'pealing. Katherine works the tart ones. The pie team featured 3 more of our all-stars, Rachel, Cristin at the sink, Linda. Guests came over to see the show. You couldn't come to our place without meeting the people and the pie. The pie crust may have set a world record for homemade goodness. The Weather Channel reported our prospects for a white Christmas. For her efforts Cristin was named the first Lifetime Pie-Goddess by the directors of the Architecture Tourist Culinary Committee. Matt was behind her 110%. Oops, I almost forgot another pattern: 199. SUNNY COUNTER. Our streak of perfect trees remains unbroken: Virginia Avenue at Inman Middle School. Some old geezer decorated it. Our babies on the tree again. We did some shopping and warehoused the loot in the big room. The Kepley's Bar-B-Q arrived from High Point. Loved ones arrived from Denver, Las Vegas, and DC. From the airport to Yeah! Burger to begin holiday stomach stretching for our BBQ dinner. A batch of cousins made a Cheerwine run (regular and diet) to Davids' on LaVista. Thanks to David and to Cheerwine Finder. We got the first puzzle started. BBQ is served. High Point natives John (center) and Susie Sherrill joined us for the memorable vinegary pork with slaw. More buds, Jasna, Nick, and Emily came over for leftover BBQ. Massive food preparation activities began (this is the 23rd) with hand crushed mushrooms Portland/Denver style. We had 50% of our IT staff solving for nutrition. Massive cooking activity I tell ya' seen here before the elves went to work. What next? Sweetwater Brewery with hundreds of our best friends. And fancy meeting you: Cristin joins the Ukraine National Handball Team. Christmas Eve activities have started. Merry Christmas and more later. Before I get started, this is about Form, the 3rd annual book featuring independent Atlanta Artists. It includes Hudgens Prize winner Gyun Hur among others. I think Atlanta Art fans should own the book. You can get it in several formats on Amazon. Mint Gallery just moved from the Cotton Docks to next door to the Cotton Docks on Sampson Street in the Old 4th Ward, halfway between Studioplex and Jacks pizza. It was my first time at Mint. It's "young," energeticm and active in promoting art and music and art and music together. You can't miss Mint on the Internet. Mint Gallery blogs. Mint Gallery is on Facebook Myspace and Flickr. It was a special occasion: The launch of the 2010 Form. "FORM is Williams England Design’s annual published collection of works from artists throughout the Atlanta area." Tonight featured the art and artists from this year's book. Most of these folks are Form artists. Didn't get their names. I loved the purple sky. Marcus Williams of We Design Atlanta told me everything. We got to vote for the cover of the special edition. I won't reveal my vote. The new Mint space has a kitchen area so naturally it was packed. These ladies sold the book. It's 80 pages in color. Mint proprietors Mike German and Erica Jamison held court. You can see them on Youtube. My one minute video is a little tour of the gallery and the Form art. Mint had just completed it's 5th Postcard Pun-up show. This beauty is the size of a post card. And looked great as a Triptych, "How We Fell In Love" by Emily Maxwell. 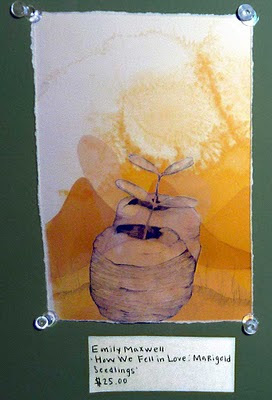 I continued my December 12th gallery hop at Castleberry Hill. One of my fellow mavens was a delightful dog, pictured below. 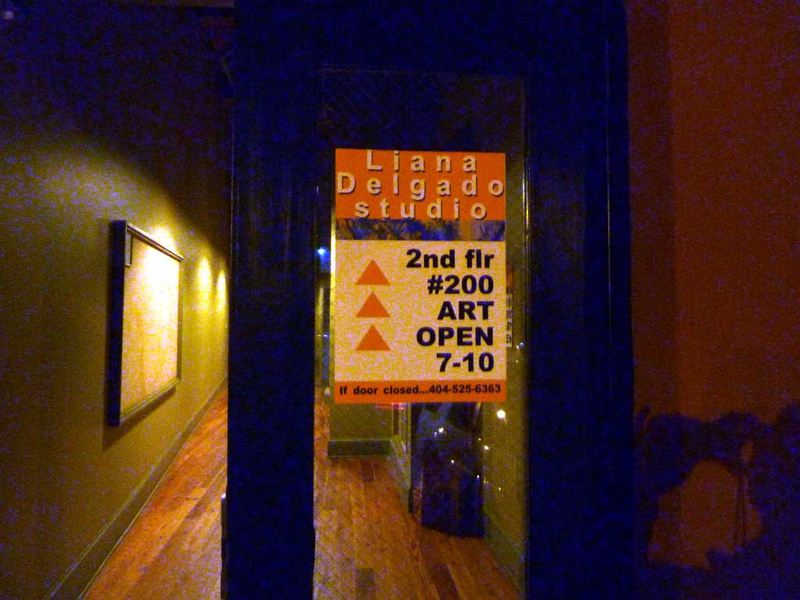 There is a new place, Liana Delgado Studio I didn't met Liana, maybe next time. It's in the same building as Peters Street Gallery, Artists Trifecta Gallery, and Besharat Gallery. It's on the 2nd floor. It's a great studio loft space on a corner. Peters Street Gallery never disappoints. There is always some wit. Here is the cutting board Buddha thing. The missing body briefcase guy. Mersad Berber's paintings look like 2000 old studies, preserved just before deteriorating. If you saw Fellini's Roma, you know what I mean. These faded colors attracted me in a gallery filled with vibrant color. I was afraid if I didn't look now, they'd soon be gone. This is "Aspiration" by Inbar Tolla at Besharat Gallery. This is Lluís Barba's Monumental "Jardin de las Delicias El Bosco." Denise Jackson's Emerging Art Scene did a Paris themed shindig. 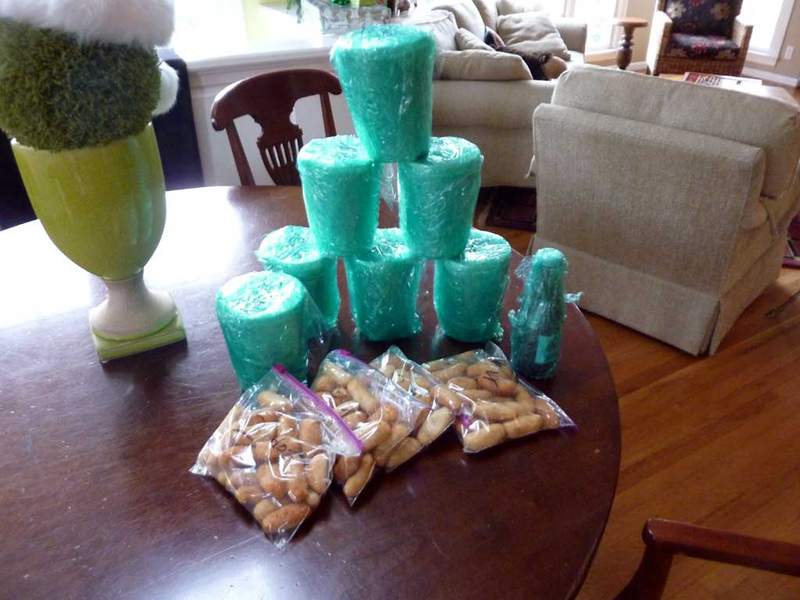 I met Julie Ross and loved her crushed turquoise glass pieces. Takes all kind of animals to make an art scene. Zucot Gallery featured Pedro Fuertes. Artist Trifecta Gallery was hosting "Fashion Uncorked" in the giant gravel floored room the the Castleberry Point lofts. I got there a bit late to this extraordinarily space. I'm a bit tired but I not yet done for the evening. They Ran Around the Cemetery!